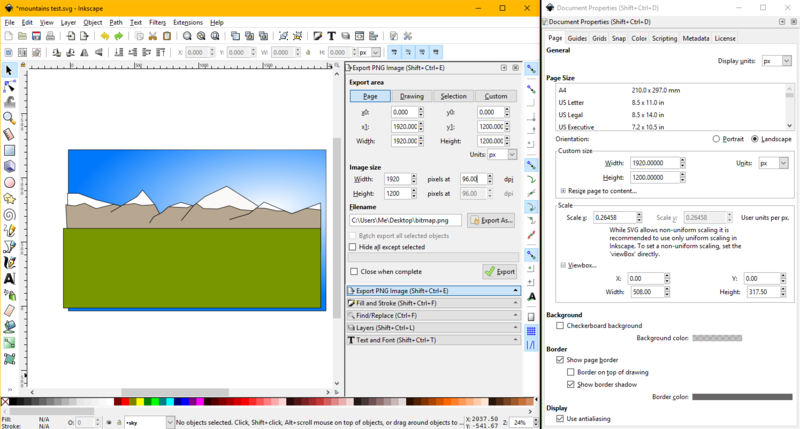 What are “user units” in Inkscape? Inkscape says the viewbox is 508 by 317.5 in "user units" but I don't recognise the numbers 508 and 317.5. I can see that 508 = 1920*xs where xs is the x scaling factor (0.24565) but I didn't knowingly choose "508" or "0.24565" - where did they come from? In your case, user units are mm at 96dpi. The default document template in Inkscape uses mm as unit for typing out values in the XML code (the text file that holds the SVG data). You must at some point have changed both the 'Display unit' as well as the unit for the document size, to px. Display unit is what is used in the dialogs and number fields in Inkscape per default. Not the answer you're looking for? Browse other questions tagged inkscape units or ask your own question. How can I set custom units in Photoshop? Are physical units for web design a good idea? What Inkscape toolbar icons are these? How to use inches in Inkscape? Are there computer graphics programs that use fractional units (not decimal)?